The island of Sicily can be summed up in one word: magnification. Everything that is Italian – the history, cuisine, architecture, are to be found amongst the regal mountain ranges and golden beaches of Sicily. Thanks to its balmy year-round sunny climate, like a jewel in the middle of the Mediterranean, Sicily is a great destination at any time of year. Though cooler from November to early spring, it’s never below 10 degrees or so, so even in mid-winter it makes for a suitable escape from our bleak British winters. To write about Sicily and not begin with some mention of its long and illustrious history would be just plain wrong. This is an island which has won praise from the classical greats such as Homer and Virgil. It was a highly prized island to ancient cultures including the Phoenicians, Carthaginians, Elymians, Romans and the Greeks. The influences of these ancient civilisations can be seen in the ruins of Selinute’s columns, and in the Concodia temple, for example. But the universal adoration for Sicily transcends the classics. Head to Palermo and see the domes and arches of the Arab world, the Byzantine mosaics and the palace walls of the Normans. In the southeast of the island, baroque architecture reigns supreme: the cathedral facades of Ragusa and Modica, the golden domes and palaces of Noto. In short, the cultural heritage of Sicily is rich beyond measure. The island is nothing less than a large, open air museum to discover. But even coming back to the twenty first century, it’s still clear to see how so many cultures and peoples have been absolutely captivated by Sicily. It won’t be long until you are captivated yourself. Sicily boasts a particularly dramatic and varied landscape. Sea, volcano and mountain scenery jostle for your attention, forming an unforgettable backdrop for your holiday. The waters surrounding the island are crystal clear, the volcanoes light up the night time sky, and the outlying islands offer a series of peepholes into how unfettered nature can thrive. It is a peaceful and utterly beautiful island. An ideal location for a romantic getaway, with an absolute wealth of exquisite dining to enjoy by candlelight, backed those famously stunning landscapes, or in the cobbled streets of a quaint Sicilian town. If not the rich golden sands and the gorgeous little towns, you will go home with the tastes of a myriad of unforgettable dishes still tingling on your tongue. With that extended introduction, here are our suggestions for places to visit during your holiday to the beautiful island of Sicily. Overlooking the town of Cefalù, an ancient Sicanian temple stands upon a rocky cliff, along with the ruins of an ancient castle. And down at ground level, you’ll find meandering narrow streets lined with fascinating little shops, and at the centre of it all, a splendid Norman cathedral. Being a coastal town, just an hour from Palermo, there’s also a lovely beach to enjoy, as a welcome break from your explorations. Of course you should pay a visit to Mount Etna during your stay in Sicily! It’s cool at the top, so bring a jumper: it’s Sicily’s highest mountain, standing about 3,350 metres tall. You can take a jeep excursion to the top of Mount Etna, which you’ll find covered in snow for four months of the year. Along with the breathtaking sight of this natural wonder, and the views looking down over the island, this volcano is also a sacred relic to ancient legends and myths. Not to be missed. Agrigento is home to several ancient Greek temples, including one of only two which remain standing on the island: the Temple of Concord. Just outside town, in the Valley of the Temples, you’ll find an expansive archeological site, another not-to-be-missed excursion on the island. In February, Agrigento plays host to the annual almond blossom festival, which is both beautiful and steeped in fascinatingly evocative ancient folklore. The twelfth century cathedral and cloister of Monreale stands on a hill above Palermo. It’s a startling vision of Norman-Arab architectural style, infused with elements of Byzantine artistry. A peaceful and enchanting place to visit, Monreale is filled with characteristically fascinating history. The time to visit Erice is, most definitely, over Easter. The Good Friday passion procession through the town brings an atmosphere scarcely to be matched in any other Catholic country. But regardless of what time of year you come, you should take some time to seek out some local pastries… they’re incredible! The lush forests immediately to the north of Mount Etna give you a true sense of how Sicily was found over two thousand years ago, when the Ausonians, Greeks and Phoenicians first arrived on the island. It’s naturally beautiful, in a surprisingly non-Mediterranean seeming way, and a charming drive. Agrigento has one of the completely standing Greek temples on the island. Segesta has the other. Segesta’s ancient Doric temple is considered the best preserved of the Greek relics. 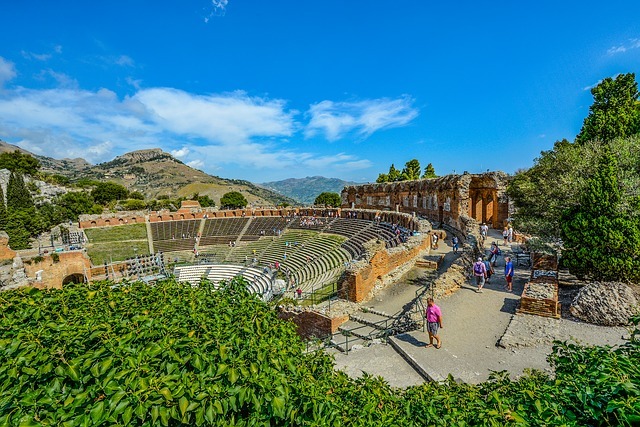 An amphitheatre set within pleasant hillside, it’s another wonderful example of what Sicily has to offer in terms of its cultural heritage. Finally, what trip to Sicily would be complete without spending time in its regional capital? Truth be told, it’s a little dusty and a little chaotic, but it’s yet another destination that’s absolutely packed with historic fascinations. If you can deal with the odd moments of crazy traffic and frequent little protests, you’ll see something honest and authentic here, which contextualises all the ancient glamour of the rest of the island within its modern setting. That being said, it’s an excellent city for a spot of shopping, as well as the fantastic dining you can expect from the Sicilians, who seem to have culinary prowess pulsing in their veins. Our advice is to avoid the tourist hotspots, and venture a little further to discover the best little eateries. Wherever you’re visiting on the island of Sicily, whether it be just chilling at the beach, or soaking up all the many awe-inspiring sights of natural beauty and ancient architecture, you’re in for a treat. With its year-round charms, timeshare owners have been attracted to Sicily for many years. But if timeshare isn’t on your mind, it’s still a truly stunning place to visit, with a range of accommodation solutions to suit every taste and pocket.